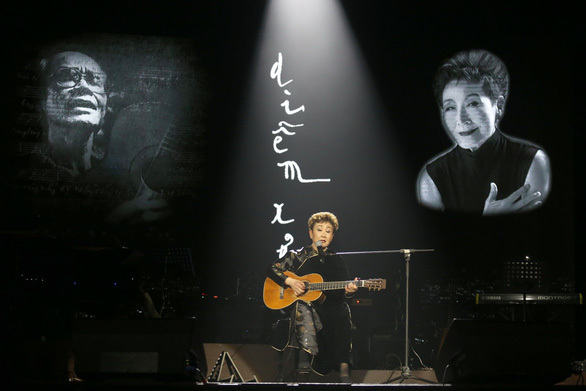 Eighteen years after Trịnh Công Sơn’s death, Japanese singer Tokiko Kato finally was able to visit Việt Nam to perform in a concert that marked the late composer’s death anniversary. Honoured to be on the stage, she shares memories about meeting the famous composer. Considering that you met him only a few times, Vietnamese audiences wonder why you love Trịnh Công Sơn and his music? Since 1970, I have listened to his music via Khánh Ly’s voice. She sang Diễm Xưa in Japanese. With the name translated into Japanese as Ame ni kieta Anata, Diễm Xưa was popular in Japan on vinyl records. I really liked this song because of its poetic lyric so I asked to perform Diễm Xưa in Japanese in a live concert in my hometown, Harbin, in 1981. It was not until 1997, when I recorded this song for my album Tokiko-Cry, that I decided to visit musician Trịnh Công Sơn’s house in HCM City. Though we met for the first time and talked for two hours, it was as if we had known each other for a long time since we shared many hobbies and interests in common. We both had suffered hard times and losses due to war. When I was two years old, my hometown, Harbin, was lost to China while my father was still in the army. We suddenly became people without a homeland and my oldest brother became the main support for my family during that difficult time. When I talked to Trịnh Công Sơn about losses in the past and of the war, he told me that it was tolerance, forgiveness and patience that had helped the Vietnamese people overcome pain and hardship. I appreciated what he said and I treated Trịnh Công Sơn as if he was my brother. Another quote that I forever remember was when he explained his choice to stay in Việt Nam: “To live and survive, people always seek better conditions. There’s nothing wrong with it. But I feel like I’m a tree on the land in which I was born. For a tree to bear fruit, it must be grown in its homeland.” I think this explains why his music lives on forever as he stayed with Vietnamese people and shared joy and sadness with them. What are the other memories about Trịnh Công Sơn that you cannot forget? When I first met him in 1997, I held my guitar and sang Diễm Xưa. Trịnh Công Sơn was excited. He told me to perform this on stage and later that day he took me to a small stage to sing. That year, I invited Sơn and singer Khánh Ly to Japan to join me in my live concert but only Khánh Ly could make it because Sơn’s health was not good. This encouraged me to produce a show in Đà Nẵng in 1999. This time, Khánh Ly could not be there. I came to Việt Nam with my daughter and grandchild who played piano. Meanwhile, Sơn played his guitar and also sang. That was the first time I saw him sing on the stage. I also remember that in 1998 when I was back in Việt Nam and participating in a mangrove-planting project in Cần Giờ and an outdoor music event, Trịnh Công Sơn drew a painting of me. Since the painting was not complete, he did not give it to me. He had a habit of drawing and hanging paintings of his friends in his living room. This later helped me become aware of his passing away. On April 1, 2001, I received a phone call from a stranger who I believed was a Japanese reporter, telling me that musician Trịnh Công Sơn had passed away. He called me because he saw a painting of me at Sơn’s house. Do you have future plans to perform Trịnh’s music? I just released an album of six CDs, of which two songs are Trịnh’s, including Diễm Xưa and Ngủ Đi Con. There is also a song called Bài hát tặng anh that I composed and performed for the first time in Việt Nam on April 2 and 3. Bài hát tặng anh has love words that I have yet told loved ones that are now gone. Even so, beautiful feelings and moments stay. That is what I have always wanted to tell Trịnh Công Sơn and his audiences.